Creggs RFC 17, Ballina RFC 38. Creggs Under-16 girls played they first ever competitive game last Sunday evening in the Connacht Under-16 Cup and put in a very spirited effort, going down to a very strong Ballina team. Creggs took a while to settle and let in 4 tries in the first half but clawed their way back into the game with tries from Anna May Keegan, Roisin Maher and Sarah Purcell to leave the score 24-17 with 10 minutes remaining. Ballina got in for a couple of late scores to put a gloss on the scoreline but the Creggs girls will be happy overall with their first game. The girls now go into the Connacht Plate competition in this their first year at rugby to continue their development in the game. 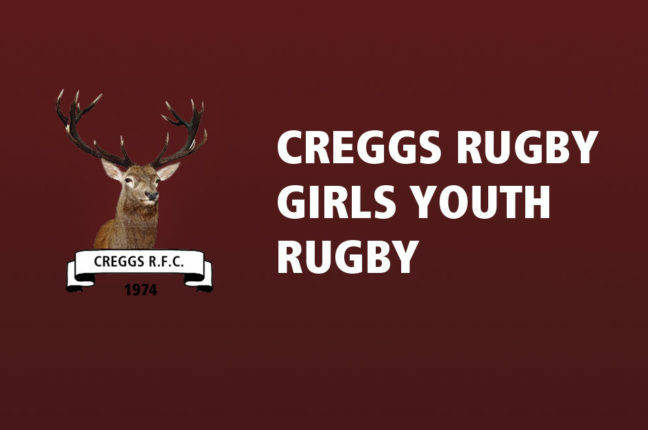 Creggs Rugby: Anna kelly, Katie Edwards, Sarah Purcell, Jennifer Morris, Rachel McDonald, Emma Mannion, Grace Hanly, Roisin O’Brien, Elaine O’Grady, Eadaoi Walsh, Caoimhe Walsh, Isabelle Gubbins, Amy Fitzmaurice, Jean O Boyle, Anna May Keegan, Eabha Dowd, Gabrielle Kilcommons, Ornella Varale, and Michaela Burke.